This newly remodeled Architectural estate lies on over an acre of prime real estate in the hills of Bel Air and offers luxurious amenities for the ultimate experience. This secluded estate home lies behind gates up a private driveway to a large motor court. 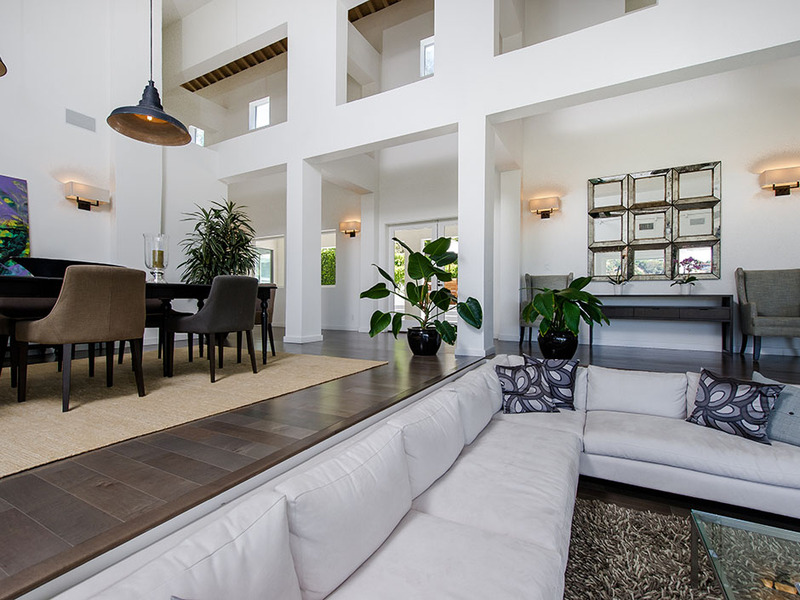 Enter into the expansive step-down living room that features high, cathedral ceilings and breathtaking, head-on city and canyon views through floor-to-ceiling walls of glass. Pocket doors lead out to the expansive deck creating great flow to the outdoors. Follow the open floor plan to the large, gourmet kitchen which features a large, center island and stainless steel commercial appliances, 2 Sub Zero refrigerators, and built-ins. This grand estate is fully furnished throughout and features 6 large bedrooms and 5 bathrooms, flat screen tv’s throughout, a bar with ocean views and seating for 6, and a private screening room. Take a dip in the private swimmer’s pool and spa amidst the beautifully landscaped grounds that surround this gorgeous estate. Coming home is like going to an exotic, private getaway.